Great deals and value on many items and deals that are hard to beat elsewhere. I bought this as a gift for my father and I am positive he will enjoy every minute of viewing of this dvd boxset, especially now that he has just bought himself a new 55" Television. Happy viewing! 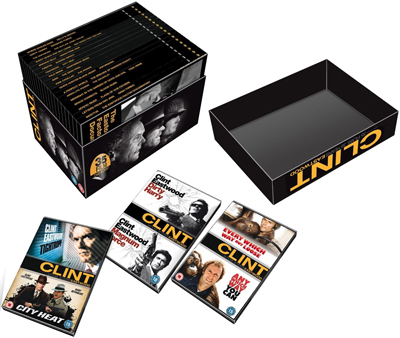 Clint Eastwood: 35 Films / 35 Years is an excellent box set and an excellent price. Great value watched about 6 of the DVDs so far all good. This Clint Eastwood box set has a very good choice of dvd's and all good quality. Great selection and a smart looking box set. Brilliant product, the only thing I was disappointed about was that it didn't have the film 'Million Dollar Baby' in. My Granddad loved it! Clint Eastwood: 35 Films / 35 Years is an excellent selection of Clint's films and is great value for money. It was the perfect gift for a Clint Eastwood fan like my fiancé.